Everything in UX design starts with information and how it’s organized. Every product stores and presents relevant information to its customer when that customer needs it. It’s impossible to build a truly great product without first building a solid information architecture. Is this information relevant to our product/company? Is it relevant to the reason our customers use our product? Is the information presented in a way that is familiar to customers? Is the information useful to our customers? Will our customers use this information to take the actions we want them to take? Is it presented in a way that is consistent across channels and mediums? Is it talking about our product and company or about our customers and their needs? Do we present this information in a tone that’s consistent with our brand? Does this information answer the most important “what’s in it for me?” question that every customer has? How does this product fit into my life? Google Maps knows where people are in the world when they open the app. There’s nothing people have to do to make the app aware—it just works. It shows their current location and direction they’re facing, and displays what actions they can take on the first screen. How do I use it, control it, or extract value from it? To extract value from a map, people have to be able to control it. Controlling it goes beyond setting the destination, departing location, and mode of transportation. 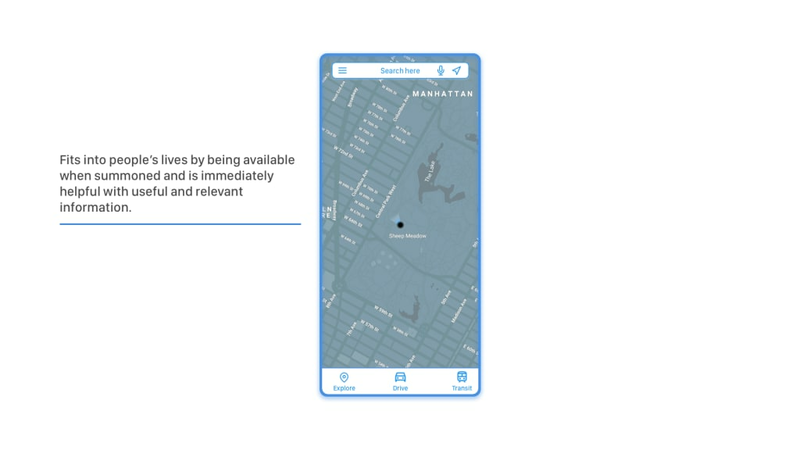 Great navigational apps take things a step further by offering granular control over when the person is expecting to leave and when they want to arrive at their destination. They help with determining the best route based on traffic and transit conditions. 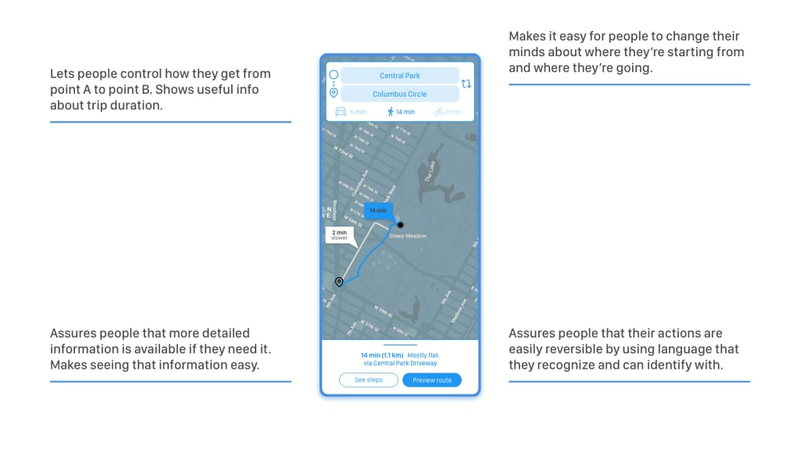 Above all, they assure people that in the process of using the app their actions are reversible, more information is just a tap away, and more value is always available should they need it. How does it reduce the pain I’m experiencing with problem X? Consider for a moment the specific pain this navigational app is seeking to remove from people’s lives. 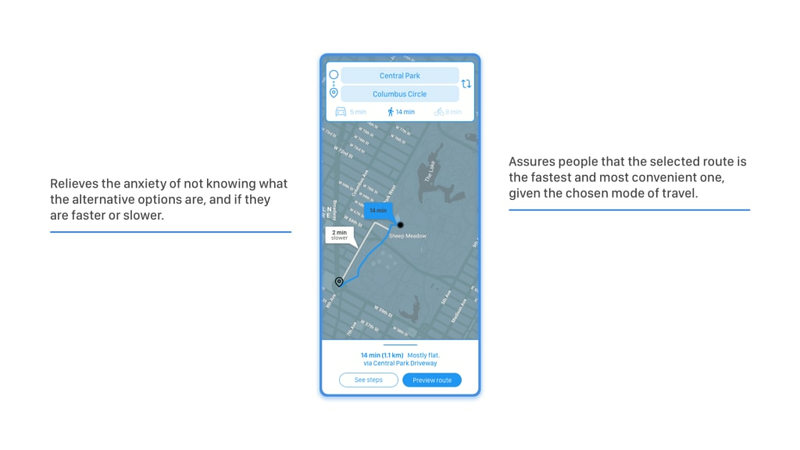 At first glance, it’s easy to assume that the problem it solves is a simple “helps people get from point A to point B” or “helps people choose the fastest route.” But it goes deeper than that. Very few people think about what the best or fastest route to their destination might be. What they actually care about is getting wherever they need to go with minimal friction and the fewest delays. The app relieves the anxiety of not knowing how to get somewhere, what the fastest route is, and whether better routes exist. It frees up people’s cognitive bandwidth by making decisions for them. After all, if we could outsource all laborious and error-prone decisions to technology, wouldn’t we? The navigational app in this example serves valuable and relevant information to the person using it. 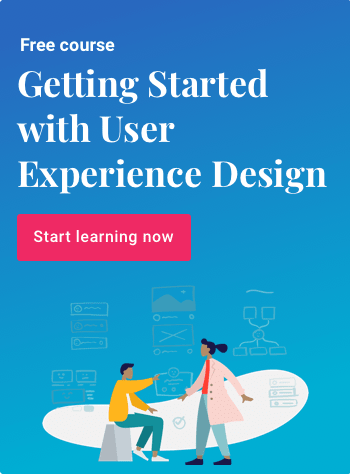 The best time to determine what information is indeed valuable for customers is at the information architecture stage of designing UX because it’s far easier to make changes to IA than it is to wireframes and mockups. The easiest way to determine what information people expect to see inside a product is a card sorting test, which we explain in detail in our new ebook, UX Fundamentals: Learn the Basics of IA, UX, and UI. Download the 50-page guide for FREE here.